ALERT FOR PA HUNTERS: Pennsylvania hunters don't pay sales tax! Call today for details. 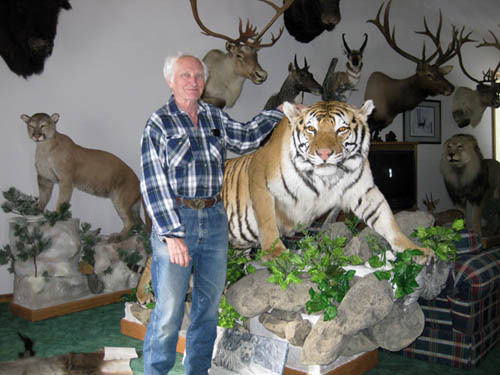 Paul Thomas, an internationally known Master Taxidermist, specializes in big game. But it wasn’t always that way. Paul's Grandpa Myers got him interested in the outdoors and hunting as a young boy. When he was in Junior High School, he started mounting animals. He and a friend hunted all over the area, and he made money mounting squirrels. Later, he became well known around Ohio for doing fish mounts (mostly Muskies). He started Paul’s Taxidermy Shop as a part-time business, doing small game, fish, deer and a few black bear. He graduated to big game (and a full-time business) after a hunting trip to British Columbia. Paul spent much of the 1970s and 1980s hunting and guiding during the spring and fall seasons in BC, the Yukon and Alaska with some of the world’s most famous outfitters. Then in 1994, Paul discovered hunting in South Africa, and a whole new world of taxidermy emerged. He has traveled and hunted in South Africa many times since. Paul has mounted thousands of big-game animals for hundreds of clients. The animals come from all over the world and many are mounted life-size. Dozens of his mounts are in museums across the United States. Please check out the photo gallery for pictures of some of his work, and contact us for a pricing schedule. Check back often for new pictures and information on hunting trips.